Finding the perfect fence is easier than you think! Virtually anywhere you go in a rural area, there will be 3 rail fences as far as your eyes can see. Traditionally, these fences were made by splitting wood lengthwise in 8-10 foot segments and affixing the sections to fence posts. They still can be made that way, but it has become far less popular. In the 1980s, vinyl fencing started to become more popular by leaps and bounds. This trend is continuing still. Today, when you go for a drive in the countryside you see those pretty white 3 rail vinyl fences everywhere. There’s something uniquely beautiful about their openness. So, why has the 3 rail vinyl fence become so popular in recent years? Here are just a couple of reasons. 3 Rail vinyl fences are far more durable than their wooden counterparts. You would require a whole lot more force to knock over a vinyl fence than you would for a wooden one. This provides your property with better security. Here on the east coast, we can get some pretty extreme weather. High winds and driving rain during hurricane season won’t damage the 3 rail vinyl fence because vinyl won’t absorb the water no matter how hard it’s raining. Since vinyl is exceptionally strong, it won’t be damaged by high winds either. Your 3 rail vinyl fence will not bend, warp, or fade. While a 3 rail vinyl fence will cost you more up front, it will end up saving you money down the road. After about 10 years, a wooden fence will start to break down. A properly maintained vinyl fence will last a lifetime, and they typically come with long warranties should something unexpected happen. Maintaining a wooden fence is a lot of work. They have to be stained every couple of years, which is not exactly a short process. You will barely have to do anything to clean your 3 rail vinyl fence. All you do is spray it down with a hose and rub out stubborn spots with a sponge. Hercules Fence Northern Virginia has countless fencing options for your business and commercial property. Whether you’re excited about a beautiful vinyl or chain link fence or already planning out your custom wood commercial fence, we are ready to help you frame and secure your property. 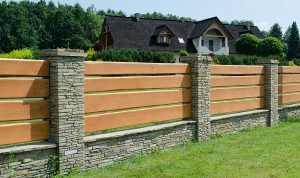 Hercules Fence Northern Virginia has been providing homeowners with quality fences for over 50 years. We are well equipped to meet your needs, whether they are residential or commercial. Contact us to see how a brand new fence can protect your property by giving us a call at 703-551-2609 or visiting us online. To see examples of our work, follow us on Facebook, Twitter, Google+, LinkedIn, Pinterest, and Flickr. This entry was posted on Friday, June 16th, 2017 at 2:28 pm. Both comments and pings are currently closed.